It is getting harder and harder to avoid the commercially produced and imported food products we encounter in every supermarket around the globe. I arrived to Fethiye by small boat (a small city on the southern district of Turkey) and taxied to the nearby organic market. It was easy to find after I was advised by a local in Göcek where to go. Otherwise I had so many conflicting information about the markets. 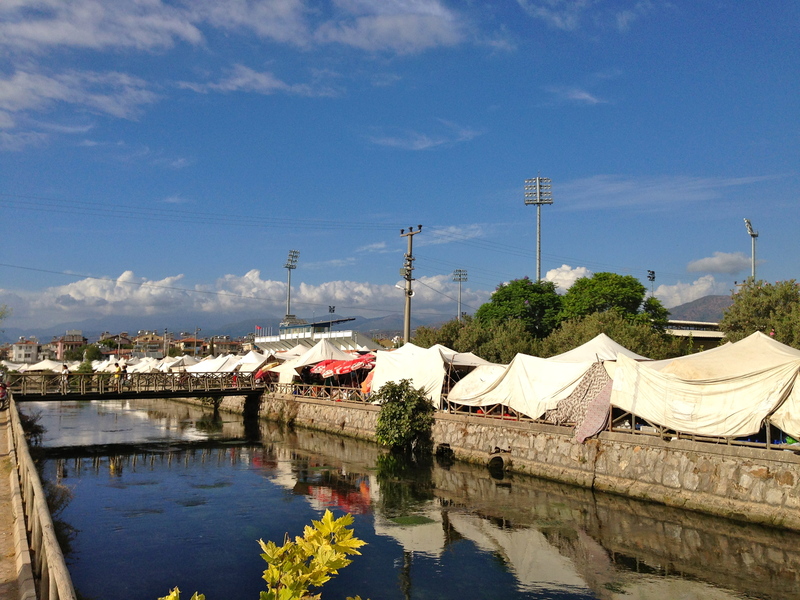 Walking along the river, the tents were a clear sign that the market was on. Trying to research the markets in Turkey is not as easy as it should be. Many markets are for the locals and not well advertised for foreigners. I walked across a small bridge, and I was into the action. Cruising the market for one and a half hours it was kilometers long, I was fascinated by the pureness/quality and reasonable prices of the local produce. I don’t think there was a single imported vegetable, I was in awe. It is a very positive sign when local produce is so fresh, yet so inexpensive giving a good foundation for the locals to fee their families. Turkey is a country that has a rich history and excellent agriculture and sustainability. It is a place where women do the “mans work” and they don’t flinch when they do it. I didn’t feel alone or alienated (given the political mood) and I was the only foreigner in the market. The vendors all smiled and were more than friendly. In fact is customary to pick a grape and “test it” to see if it meets your satisfaction, while in most markets you would get scolded.